Finally after two days in limbo in two US airports, I made it home. I am utterly exhausted yet of course it is right back to it. As a stay at home mom of two young children, there is not much time to relax or recuperate. I made it home unexpectedly through a bit of luck. Two amazingly kind United Airlines gate agents, one in Houston and one in Chicago, were looking out for me. After I landed in Chicago, to my dismay things were delayed as well. There were 48 mph winds causing O’Hare to shut down runways and delay and cancel flights. I used my weary head and immediately went over to the departure gate for the next flight out of O’Hare to Minneapolis. I told the agent my story and she put me on the standby list. The flight was supposed to leave at 2:20 pm but the pilots were delayed due to weather. Thus I ran over a few gates down and put my name on the standby list for the 3:30 pm flight. I was third on the list for the flight when the agent informed us that the plane had maintenance problems! Not knowing what else to do at this point, I ran back to the other gate for the delayed 2:20 flight (it was 3:30 at this point) and the gate agent told me there was no chance. It was leaving. I turned to walk away not knowing what to do when I heard someone running after me, calling “Young lady!” urgently. I turned around, and it was her. “Come quick!” I started to run and before I knew it I was on the plane to Minneapolis, the doors closed and of course I lost it. I was so incredibly tired at that point that I could no longer control myself. I was going home. At 5 pm, I landed and nearly raced off the plane to greet my children. Tears poured out of my eyes out of exhaustion and happiness to be home safe and sound. They kept saying, “Mama, why are you crying?” I told them that I’d have to explain it later. It was a long story! Here are some photos of leaving Antigua on Sunday morning around 10 am. 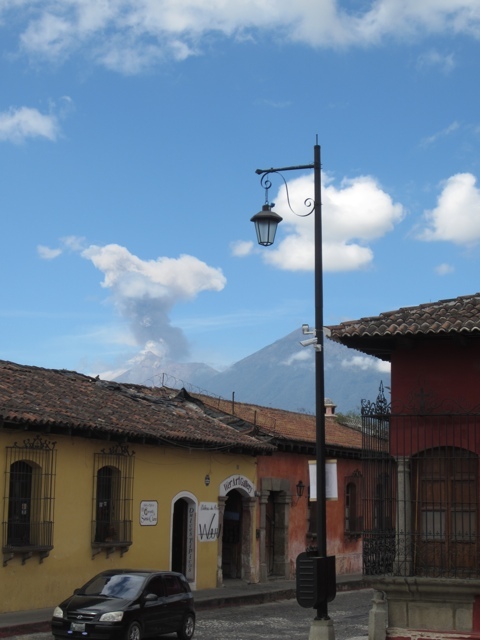 The city of Antigua is surrounded by three glorious volcanoes, in which one, “Fuego” (or “fire”) is active. It has been cloudy most of the day on Saturday so I never saw the peaks of the volcanoes. Yet someone was looking out for me because not only did I see all three peaks Sunday morning I also saw Fuego, the active volcano erupt! Right as I was leaving town, Fuego blew its top. It was a strike of pure luck! Somehow or another I’d make it home safely and in once piece! 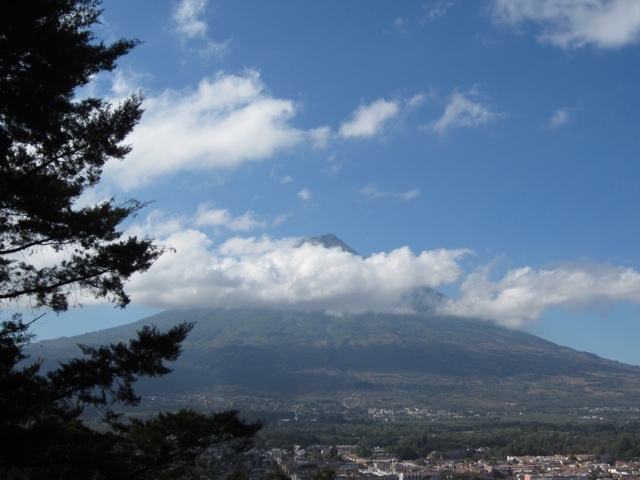 The last two pictures above are my first sight Sunday morning of the tops of all three volcanoes surrounding Antigua. I finally saw them! Three large volcanoes dominate the horizon around Antigua. 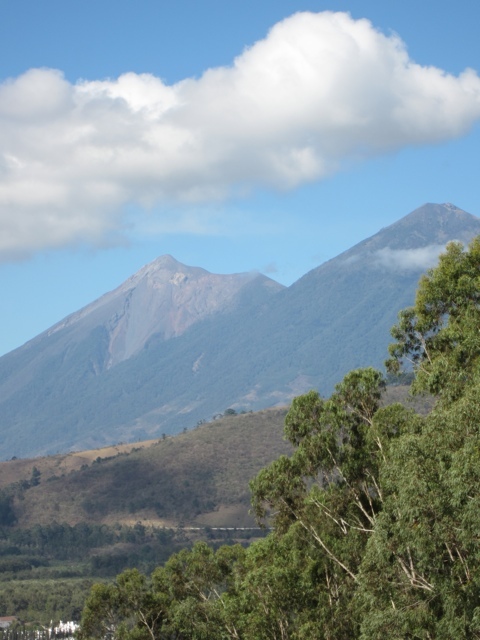 The most commanding, to the south of the city, is the Volcán de Agua or “Volcano of Water”, some 3766 meters (12,356 ft) high. When the Spanish arrived, the inhabitants of the zone, Kakchikel Mayas, called it Hunapú (and they still do). 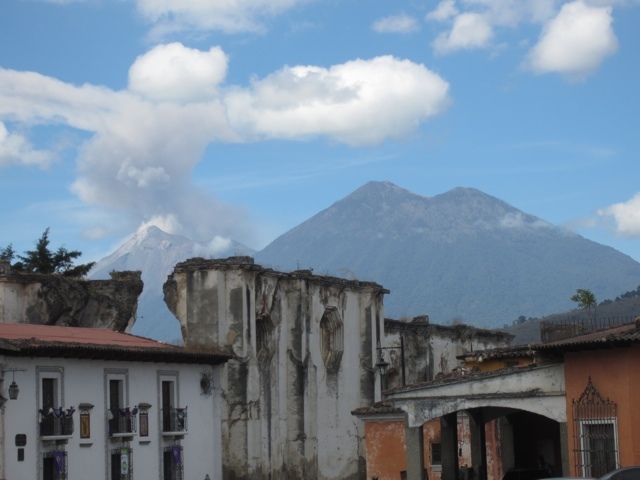 However, it became known as Volcán de Agua after a lahar from the volcano buried the second site of the capital, which prompted the Spanish authorities to move the capital to present-day Antigua. The original site of the 2nd capital is now the village San Miguel Escobar. 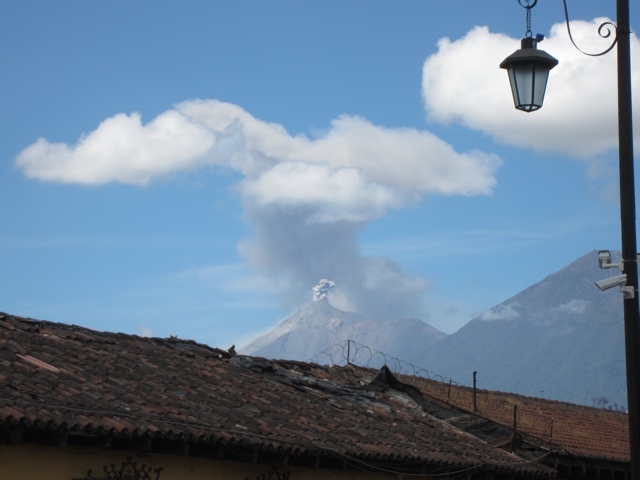 To the west of the city are a pair of peaks, Acatenango, last erupted in 1972, some 3976 meters (13045 ft) high, and the Volcán de Fuego or “Volcano of Fire”, some 3763 meters (12346 ft) high. “Fuego” is famous for being almost constantly active at a low level. 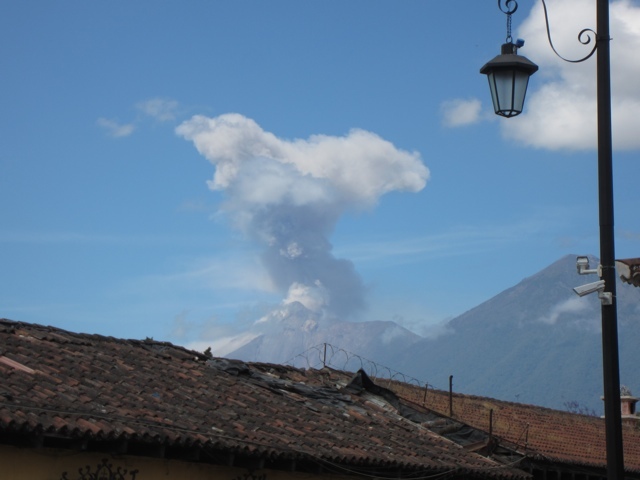 Smoke issues from its top daily, but larger eruptions are rare. Stay tuned….I promise I will back up and start from the beginning of my trip to Guatemala, with day one Arrival and my long bus ride from Guatemala City to Xela in the highlands, were I stayed for the week. I can’t wait to share more! Thanks for reading and all the comments! I’m working on catching up and answering them all! Yeah, you’re home safe and sound. Have a nice hot bath and sleep. THanks! I am having a nice glass of red wine now and trying to catch up on my emails! Ahhh…what a trip! So happy you made it home in the end Nicole and also that Fuego puffed goodbye to you! We were so lucky Sunday morning to have clear views of all 3 volcanoes! Looks like you got some good photos. Enjoy being home! So glad to hear you made it home, Nicole. Try to get some rest. Welcome home! Enjoy time with your family. Great pictures and look forward to seeing more pictures from your trip. Thanks!!! I can’t wait to share a post on the clowns I met in the airport! They were doing nonprofit work for a group under Patch Adams and using laughter therapy at orphanages and impoverished areas. I thought of you and your philosophy! Post coming….